Brining yields a much more moist and tender Turkey. Make sure you have room in your refrigerator before you start this. Brining your turkey results in a moist and juicy, not “watery” bird. This method can be used on chicken as well, but you don’t need to brine as long. Rinse turkey under cool running water, inside and out and remove the giblets from body cavity. Pat turkey dry with paper towels, then immerse turkey in cooled brine. The turkey should be completely submerged in liquid. Place a plate on top of the bird if necessary to keep it covered with the liquid. Cover the pot and refrigerate for 8-10 hours. Remove turkey, rinse, pat dry, and roast as usual. *Be sure container for turkey in brine is non-reactive: use enamel, glass or crockery or stainless steel – never cast iron or aluminum. The pot should be just large enough to just contain the turkey. Combine Butter, sugar, marjoram & lemon peel in a small mixing bowl. Place towel dried turkey breast side up on rack in a shallow roasting pan. Separate the skin from breast meat. Spread half the glaze over the breast meat just under the skin. Melt the remaining glaze & cool slightly, stir in the cider beer. Brush mixture over outside of turkey. Season with salt & pepper. Lace up the turkey, tuck in the wings and neck skin. Insert the type of thermometer that can stay in the oven the whole time during roasting process OR buy yourself a very nice instant read thermometer to use towards the end of your cooking time. Tent loosely with foil. Roast at 325 for 3 3/4 – 4 1/4 hours or at LEAST until the thigh meat reads 180 degrees F. Remove foil during final 30 min of roasting to allow browning process. Besides the temp test, turkey is done with drumsticks move easily and juices run clear. Remove turkey from oven and recover with foil and allow to stand for 15-20 min before carving. This is essential to allow juices to be reabsorbed from outside back into fibers of meat. Garnish with fresh herbs for presentation if desired. Soaking a turkey in a salt-and-sugar solution adds moisture to the meat. This is an especially good technique to use with all-white meat, which can become dry when roasted. Soaking the breasts after brining in fresh water prevents the meat from being overly salty, although it will be somewhat saltier than turkey that has not been brined. Keep this in mind when salting the gravy to keep the flavors of the dish in balance. To make the brine, in a stockpot, combine the water, salt and brown sugar. Place over medium heat and cook, stirring, just until the salt and sugar dissolve. Let cool to room temperature. Rinse the turkey breasts and pat dry. In 1 very large or 2 large glass bowls or other non-aluminum containers, cover the turkey breasts with the brine. Add ice as needed to cool the brine and cover the breasts with brine when melted. Refrigerate, turning the breasts occasionally in the brine, for 24 hours. Drain and pat dry. Trim excess skin from the turkey breasts. Position a rack in the lower third of an oven and preheat to 325°F. Spread 1 1/2 Tbs. of the butter over each turkey breast. Place the breasts on a rack in a flameproof roasting pan. Scatter the onion and carrots in the pan around the turkey. Roast for 30 minutes. Meanwhile, in a small saucepan, combine the chicken stock, the remaining 6 Tbs. butter, the white wine, oil and lemon juice. Warm over low heat until the butter melts. After 30 minutes of roasting, baste the breasts with some of the stock mixture. Continue to roast the turkey, basting every 30 minutes with the remaining stock mixture and then with the accumulated pan juices, stirring the vegetables in the pan occasionally, until the breasts are well browned and an instant-read thermometer inserted into the thickest part of the breast registers 165°F, about 2 hours. Transfer the breasts to a cutting board and cover loosely with aluminum foil while you make the gravy. To make the gravy, place the roasting pan with the vegetables across 2 burners and turn the heat to medium-high. Add 6 3/4 cups of the turkey stock to the pan and bring to a brisk simmer. Stir to deglaze the pan, scraping up the browned bits from the bottom, about 5 minutes. Pour the contents of the pan through a sieve set over a large bowl, pressing hard on the vegetables with the back of a large spoon to extract all the liquid; discard the solids. Spoon off as much of the fat as possible from the liquid, or pour the liquid into a fat separator and pour off the liquid. Transfer the liquid to a wide saucepan. Place over medium-high heat and simmer briskly until reduced by one-fourth, about 10 minutes. In a small bowl, stir the remaining 1/4 cup stock into the cornstarch to make a slurry. Gradually stir the slurry into the saucepan. Stir in the parsley, lemon juice and lemon zest. Cook until the gravy clears and thickens, about 1 minute. Season with salt and pepper. Slice the turkey breast against the grain, on a slight diagonal, and serve with the gravy. Serves 8 to 10. Make-Ahead Tips: The turkey must be put into the brine 24 hours before roasting. The stock may be made up to 3 days in advance and refrigerated, or up to 3 months before and frozen. Or, it may be made while the breasts soak in fresh water before roasting. 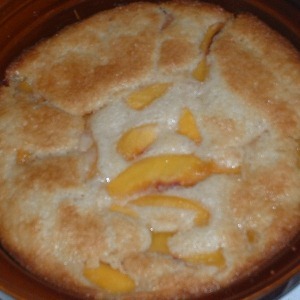 This is my favorite Peach Cobbler because it is so simple to make. You could use any fruit- cherries, blackberries, canned fruit cocktail is good. The finished cobbler is very moist. Put the ½ stick of butter into a shallow baking dish. Place into oven for butter to melt. When butter has melted remove from oven and swirl pan so that all of the pan bottom and sides are covered. Mix the flour, sugar, and milk together in a large bowl until mostly smooth, there will be a few lumps, that is ok.
Pour the batter into the butter in the baking dish. Do not stir. The butter will pool a little in the corners. Spoon the fruit and its juice into the batter. Try to spread the peaches evenly over the batter, but do not stir. Bake at 350 for about 45 minutes until lightly browned. The batter will rise and cover the fruit.